Many puppies scratch, lick, or bite themselves to relieve itching, which can be caused by a variety of conditions. While the behavior may simply indicate that your dog is bored or stressed, constant scratching may be a sign of a more serious condition, such as an allergy, a parasite, or a skin infection. 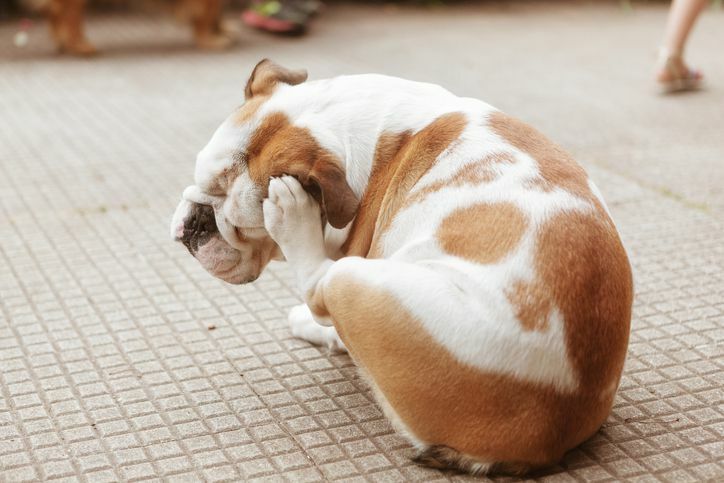 It’s not uncommon for a puppy to scratch itself from time to time, but an itchy pet is uncomfortable, and all of that scratching, licking, and biting may invite a host of other problems. Don’t try to treat this symptom before you know the cause, because you may do more harm than good. A visit to the vet is the first step in finding out the cause of your puppy’s itchy skin and providing the proper treatment. Why Do Puppies Itch and Scratch? Dogs—and puppies especially—have sensitive skin. While some breeds can tolerate a lot of environmental allergens without any problems, others seemingly react to anything they touch. Puppies, especially those who spend a lot of time outdoors in wooded areas, are prone to flea infestations. Fleas bite, ingest the puppy's blood, and attach themselves to the animal's skin. Flea saliva can cause severe allergic reactions in some dogs. While some puppies and dogs are not bothered by fleas, for most, a flea infestation is extremely unpleasant and uncomfortable. Flea infestation is one of the most common conditions that cause dogs to scratch and bite at their skin. It's also one of the most challenging to treat because fleas are so tough to eradicate and can get into carpets, furniture, and other parts of the house. The second-most common cause of scratching in puppies is an allergic reaction, usually to something in the environment such as dust or pollen. These kinds of puppy allergies may be similar to hay fever in humans, but instead of causing a runny nose or sneezing, the allergen causes itchy skin. Some puppies are susceptible to the more serious condition atopic dermatitis. This is a severe allergic reaction seen mostly in bulldogs, retrievers, and terriers. Atopic animals often start out with seasonal "peaks" of itchy skin, but over time, the peaks may last longer as the animal is repeatedly exposed to the offending allergen. Dogs typically develop atopic dermatitis and other allergies as puppies, and the severity of symptoms can vary depending on the allergen causing the problem and how early the condition is detected and treated. Usually affecting puppies younger than one year old, ringworm is highly contagious, even to humans. It presents as a crusty rash on the puppy's skin, which usually causes intense itching. This fungal parasite feeds on dead skin, fur, and nails. While the symptoms of ringworm usually display in humans as a red, ring-shaped rash that spreads out from a central point, it may look different in puppies. The animal's head and front legs usually show signs of ringworm first, so if your puppy is scratching those areas intensely, this may be an early warning sign. A puppy that's stressed due to a move or a change in its day-to-day routine may scratch to comfort itself or to attract the attention of its owner. The same is true for a dog that's bored or understimulated. There are skin and blood tests available to help determine what a pet may be allergic to, with skin tests usually considered to be more accurate. In addition to allergy testing, the veterinarian will want to rule out other causes of itchy skin, such as fleas, food sensitivity, fungal or bacterial infection, or a reaction to medication. If the testing reveals an allergy, your veterinarian may give your puppy allergy shots to reduce its sensitivity to the allergen in question. This treatment is commonly used in humans to reduce allergic reactions but with mixed success. For a puppy with atopic dermatitis, you may receive cortisone cream to apply to the affected area and possibly antibiotics if an infection has developed. In severe cases, your puppy may need a prescription for prednisone, a steroid effective for reducing itching and inflammation. As for ringworm, in some puppies, it clears up on its own. However, if your puppy's ringworm has spread to people in the home or there's someone in your household who has a compromised immune system, your veterinarian may order treatment with oral and topical antifungal medications. The goal of any skin therapy is to keep the pet itch free on the lowest possible dose of medication. While you may not be able to get your puppy to completely stop scratching itself, there are steps you can take to reduce its discomfort. If you have a bored puppy, usually more playtime or interaction with you is prescribed. If your puppy is stressed, reducing or removing the source of the stress can eliminate this type of scratching. Antihistamines, fatty acid dietary supplements, and anti-itch shampoos and conditioners for bath time can provide relief for dogs with allergies, but be sure to check with your veterinarian before using any of these treatments. Frequently wash any soft surfaces your dog comes into contact with, such as beds, toys, and blankets. For dogs with fleas, preventive treatments, such as flea collars, may be effective. Consult with your veterinarian to be sure you're using the safest, most-appropriate flea treatment for your puppy. And be advised that puppies and dogs can build up immunity to flea medications over time, so your vet may recommend switching to different therapy from time to time even if the current one appears to be working well. Can Head Lice Transfer From Humans to Pets? Why Do Dogs Scoot on Their Butts? Why Does My Dog Hyperventilate When Excited?